Does Grammar really have to be so complicated? What if there were an easier way? When learning English one of the most difficult and overwhelming things every learner is going to face is using and understanding grammar. But if you would like find a way to practice and learn grammar in a very easy and quick way, a way that is going to ultimately help you internalize all these verb tenses and be able to use them without having to think very much, then you have to read this article. The problem with grammar is that it is made up of such strict rules and structures that it tends to leave the student feeling like they aren’t really speaking English, but solving some kind of math equation. In this article I’m going to present you with a method I use to teach all of my students, a method which has proven to be flawless in making these boring grammar classes nothing more than a daily 10 minute routine. 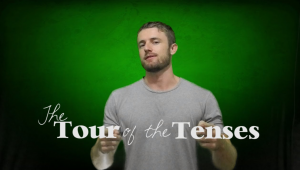 The “Tour of the Tenses” is an exercise I give to all of my students to do in their spare time as a way to program their brains to be able to use the right verb tense automatically without having to think too much. This is definitely one of the first steps to the path of fluency and should be done by English learners of all levels. 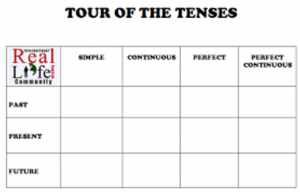 This is an exercise based on the tour of the tenses table (see below). The idea of the exercise is to write down or think of a phrase, generally with just a simple subject – verb – object structure. For example, I eat hamburgers. Once you have decided on the phrase, you can now go through the tour of the tenses conjugating your chosen phrase into all the different boxes seen on the table. 1. Write the phrase you wish to use, try to always use a new verb so you are always improving your vocabulary. 2. Look up the verb to see if it is regular or regular. 3. Go through the table conjugating the verb in the affirmative form. 4. Go through the table making negative phrases. 5. Go through the table making Interrogative phrases. Did you eat hamburgers? Were you eating hamburgers? Had you eaten hamburgers? Had you been eating hamburgers? Do you eat hamburgers? Are you eating hamburgers? Have you eaten hamburgers? Have you been eating hamburgers? Will you eat / Are you going to eat hamburgers? Will you be eating hamburgers? Will you have eaten hamburgers? Will you have been eating hamburgers? 6. After you have mastered doing the affirmative, negative and interrogative structures, you must now start to associate each box with a time reference. The easier it is to associate a verb tense with the time expressions you want to use, the more you will start to flow with your spoken English, and not have to think so much when talking. 7. After this has become an automatic process, make it into a daily habit using three NEW verbs every day. Once you can go through the whole tour of the tenses table without having to look at the worksheet, you have pretty much dissected all the most important verb tense grammar rules that sometimes take people years to learn when studying in traditional schools. Note: There are many conjugations that aren’t on the list, like conditionals, “used to,” modal verbs, and passive voice. But, this is a really good foundation, and if you can master the whole table, then most of the other things will just come along naturally and make a lot more sense when they do appear. Here at Real Life English we believe that everyone has the right to speak English, and should be able to do this without having to pay lots of money on classes or, having to travel to all parts of the world just to learn and practice. If you want to make the most of what we have to offer, join our online facebook community, listen to our weekly podcasts, but more importantly, sign up to our mailing list where you will get all the newest information of what’s going on at Real life English. IMO English grammar is not so difficult as some students might think in comparison to Portuguese grammar, so here in Brazil we conjugate verbs which is quite hard to people from other countries to master, however there are some different aspects, I think I could say “tenses” here, from one language to another that are hard for us Brazilians to master in English, as for me, “present and past perfect” were the hardest to learn, by the way, pretty interesting method to teach grammar! I learn a lot with you, Thanks a lot. Thanks for reading guys, I hope it helped. Recognize the verb in a few sentence is necessary to understand what that statement stands for. Great idea …. I´ve done something like this with my students , and it is really helpful !!!! Thanks for sharing ! You are a really good teacher. The tour of the tenses is very helpful. I'll follow your advice and do it as often as possible. i hope that you can share your English with me, i'm not good at E, would u mind? You are welcome Ruby Nguyen Talk to you soon. Hope to be fine and healthy! Hey you guys! You’re the best ever! This article was really helpful!!! I’m pretty bad in grammar, actually in verbs but with this treasure I will reach my goals with that. Tour of the Tenses is amazing and Chad is a genius! Good afternoon! I have one question, please. How can I do with the regular verbs? I’m a beginner student and I have a lot of difficulties. Thank you for this article! Very good! Thanks for reading and supporting Laurel!!! I think it’s ok, but with reduction words and links phrases sound much better. Awww Yeahhhh. Thanks guys. Thanks for reading, Jose!! Aww yeah!! Oh my goodness !!! and you dare to tell me this secret now ?? After spending the last 8 year trying to memorise all the verb tenses without any result . ha ha. I have found this trick really useful and it really blows my mind. Seriously guys, you are very talented. way to go. and thanks to be there to enlighten our path to fluency. Hahaha Jaime, the same thing happened to me when I got my TOEFL teacher’s certificate. I studied for 15 hours and got 98% on the test. Then I forgot everything. 2 years later (when I started teaching) I relearned it all in the Tour of the Tenses in 3 minutes. Glad it was helpful buddy! hey guys, that’s awesome , thank you !